THE EARTHWYRM: a dragon takes over as Royal Gardener! 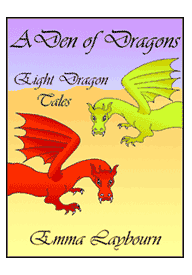 A free story for kids to read, print or download. Annie was the gardener's daughter, and she was in trouble. Her father was not just any gardener: he was the Royal Gardener. Day after day he tended the palace gardens, mowing and hoeing, seeding and weeding. When she wasn't at school Annie followed him around with the wheelbarrow. She was supposed to be learning the trade. "This will be your job one day," her father told her. "It runs in our family, being Royal Gardener." Annie just smiled and turned a cartwheel. She didn't say anything because she didn't want to disappoint her father; but she would much rather play in the garden than work there. The beech avenues were perfect for hide and seek. She could climb the apple trees in the orchard, roll down the grassy knoll from the sundial on the top, or pretend she was lost in the Maze. Best of all, she liked to lie on her stomach on the palace lawn, watching the tiny garden creatures battle through their miniature jungle. She hunted spiders and followed ant-trails and observed the bees, all the time with the comfortable click-click of her father's shears in the background. Then one day, the shears stopped. "Ow!" said her father. "Ouch!" He clutched at his back. "You'd better go and lie down," said Annie. "Lie down? I've got far too much to do! I've got to get everything ready for King Florizel's Garden Party tomorrow." He tried to straighten up, and winced. "Ooh, that's painful!" "Don't worry," said Annie. "Go home. I'll do the garden for you." She took him firmly by the arm and led him back to their house. Her father tried to protest, but not very hard. His back was hurting too much. "Don't forget the shrubs- "
"It all has to be perfect for tomorrow!" he called anxiously as Annie left. "It will be!" she answered blithely. Back in the palace gardens, she climbed to the top of the grassy hill and stood by the sundial, leaning on her father's spade. She was in charge now. From here she could see the whole garden. And now that she took a good look, there was far more to do than she had supposed. The lawn really was shaggy. The shrubbery needed a good haircut too. The brick paths of the maze were blotched with weeds, the nursery beds were overgrown, and all the glass panes in the greenhouses were broken. She turned to look over the high wall into the kitchen garden. It was full of birds busily stripping the blackcurrant bushes bare. Quickly she switched her gaze to the rose garden: the King's pride and glory. Today the air above it shimmered - but not with heat. A haze of greenfly swarmed around the roses. Annie groaned almost as loudly as her father had. Now she understood why he always said there was too much work here for one man. "Why did I tell him I could do all this?" she cried. "Where do I begin?" Angrily, she plunged her father's spade into the ground. "There's far too much! I'll never get it done!" Then she sat down rather suddenly, because the ground had moved. A ripple ran through the hill like a small earthquake. Annie sat on top of it with her mouth open and her eyes popping. She stared at the gash that her spade had cut in the grass. It was slowly widening. The sundial tilted and fell over. Longer and longer grew the crack, spreading like black lightning, until it ran all the way round the hill. "Just like a boiled egg about to be opened," thought Annie. "And I'm sitting right on the top!" She threw herself across the crack and rolled down the slope. She was only just in time. The crack was still spiralling its way down like an apple unpeeling itself. And then the top started to lift off. The whole hill shuddered. The grassy peel was tossed away into the air. Clods of turf whizzed over Annie's head and thudded softly on the lawn behind her. She stared at the unpeeled hill. It was made of neither soil nor rock, but something else: something coiled, green and wetly glistening. A long, thin neck uncurled. It looked like a snake - but it was far, far bigger than the grass snakes that sometimes dozed around the sundial. The head turned a sleepy yellow gaze on Annie, stretched out towards her and yawned in her face. It had a great many teeth which looked extremely sharp. Shutting its mouth with a snap, it opened its golden eyes very wide. "Well?" it said with a hiss. "What did you wake me up for?" "Slugs in the cabbages? Locusts in the greenhouse? Or just an invading army of ants?" "None of those," said Annie, quite bewildered. "I didn't mean to wake you up at all. Who are you?" The yellow eyes gleamed at her balefully. "Who am I?" it hissed. "Don't you know? I thought everyone knew me. Why, King Florizel the Fourth even gave me the freedom of the city!" "Certainly! For I," announced the creature with great dignity, "am the Earthwyrm." "You don't look like an earthworm," said Annie. "Not a worm. A wyrm. With a y. Otherwise known as a wyvern. Oh, all right then, a dragon, but of a most superior sort. I suppose you have heard of dragons?" "Oh, yes. But where are your wings?" The Earthwyrm uncoiled itself a little more. A single pair of legs appeared. Annie waited for the other pair, but that seemed to be all there were. With a creaking sound, two rather damp and crumpled wings unfolded and waved feebly. "Ouch," said the Earthwyrm. "My back! I've been curled up for too long." "My Dad gets backache," said Annie sympathetically. "He's the Royal Gardener, but he can't work because of his back, so I've got to do it. Oh, dear! And now look at the state of that hill, on top of everything else!" "He's what?" roared the Earthwyrm. "Your father! Royal Gardener? A human?" It spouted an angry blast of orange sparks. Annie took a few steps backwards. "Why not?" she said stoutly. "So was his father, and his grandmother. It's in the family." "Disgraceful! I'm the Royal Gardener! An Earthwyrm has always been in charge. Why couldn't King Florizel have waited for me to wake up?" It blew out another cloud of sparks with an affronted WHOOF. Annie wondered how to put it tactfully. "Maybe because King Florizel the Fourth isn't around any more," she said. "He hasn't been around for three hundred years. We're onto King Florizel the Fourteenth now." The golden eyes dulled. "Ah," said the Earthwyrm. "Hmmm." It stared around the garden. "I must have overslept," it said regretfully at last. "That's the trouble with hibernating. Never know when you're going to wake up. I can see now that things have changed considerably. And not for the better!" "My father does his best," said Annie. "But there's an awful lot of garden, and there's only him and me to do it. And tomorrow it's the Royal Garden Party. I'll never manage it all!" Despair overcame her. "I should think not. A human, indeed! What this garden needs is an Earthwyrm." Annie was nettled. "I suppose you think you could do it in no time!" "Certainly," it answered haughtily. "However, I'm not going to. It's not my job any more." "I wish you would show me how it could be done." The wyrm half-closed its eyes. "Like I said, I'm not the Royal Gardener now." "But you could be again," suggested Annie, "after my father, if you don't mind waiting twenty years till he retires." The eyes snapped open. "Twenty years? That's nothing," said the Earthwyrm. "Could it be arranged?" "Oh, yes," said Annie earnestly, giving away her inheritance without a sigh. "But only if the garden is ready by tomorrow!" "Hmm." The Earthwyrm unfurled its claws, stretching like a cat. "Let's see. It really has been dreadfully neglected. It's a challenge all right! I shall start with the lawn." "The lawnmower's in the shed." "Lawnmower? Modern nonsense!" said the Earthwyrm scornfully. And with a loud clap of its wings it rose straight up into the air, unrolling the last of its long, long tail. It was a very thin tail, Annie noticed: as thin and flat as a knife. The end of it was barbed like an arrowhead. "Watch this!" The Earthwyrm hovered for an instant high above her, then turned and swooped towards the lawn. It gathered speed so fast that Annie was convinced it was going to crash right into her. She dived into the shrubbery. Behind her came a rush of air as the Earthwyrm skimmed the lawn. Gliding fast and low, it began to sweep its tail from side to side. It was raining grass. The wyrm swooped to and fro, scything with its tail until the entire lawn was shaved in a rather unusual fantail pattern. "Pretty," said Annie, shaking grass cuttings from her hair. "What about the bushes?" "Easy," said the dragon tersely. It landed by the shrubbery and whipped its tail back and forth, slashing at the leaves. Annie ran to gather up the clippings, ducking to avoid the tail whenever it swished past her. Soon her wheelbarrow was overflowing. "The maze is full of weeds," she began; but the Earthwyrm was already on its way. It moved with something between a crawl and a slither, dragging itself on its two scaly legs. At the entrance to the maze, it lowered its head and breathed long, red tongues of flame across the paving. The weeds turned black and shrivelled up. The wyrm crawled further into the maze and disappeared around the corner. "Hallo?" called Annie after several minutes. "Are you lost?" The Earthwyrm reappeared. "The very idea! I planted this maze." "It's a very good one," Annie said politely. "Mazes are my speciality. And that avenue of beeches: that was mine. And the kitchen garden..." It broke off and cocked its head, eyes glinting. "Birds? What are they doing there?" It rapidly slithered to the high wall round the kitchen garden. It sprang to the top, wings arched high above its head, its tail swishing furiously. Opening its jaws wide, it roared. Dozens of startled birds shot up from the blackcurrant bushes, screeching with terror, and flapped away as fast as they could. "Good riddance," grunted the Earthwyrm. "They won't be back for a while." Reaching down to take a mouthful of blackcurrants, it chomped them thoughtfully. Purple juice trickled down its neck. "How are you with greenfly?" asked Annie. "The roses are covered with them." "Greenfly don't scare so easily. Different tactics are needed." The Earthwyrm crawled swiftly to the rose garden. Rearing up, it cleared its throat with a sound like sand being shovelled. "WHOO!" It huffed a cloud of dense black smoke that wafted gently across the flowers. Annie coughed and choked. Her eyes were watering. As the smoke drifted away, she saw thousands of tiny green bodies tumbling from the roses and hitting the ground. "Harumph," rasped the Earthwyrm. "Excuse me. Now, what's next?" "The orchard? The apples are starting to fall, and the King won't want them squishing underfoot." "I'm not a fruit-picker," said the dragon haughtily. "That's servants' work. But I'll give you a lift." So with a basket over each arm, Annie hoisted herself gingerly onto the Earthwyrm's back. Its skin was cool and slightly damp. When it sprang into the air, there was nothing to hang on to but the slippery edges of its wings. She did not enjoy the apple-picking. The Earthwyrm kept moving just as she was reaching for the furthest apples, and she decided that it was doing it on purpose. But at last there were several baskets full of apples lined up on the grass. "I think that's everything," the Earthwyrm said, and yawned. "Dear me, two hours to spare till sun-down." "It's not everything!" cried Annie. "What about that hill you unpeeled? Look at it! It's in a worse state than the rest of the garden put together!" "Oops," said the Earthwyrm. It slithered back across the neatly shaven lawn towards the bare, black mound. After crawling twice around the hill, it lay staring up at it, tail twitching. Annie began to pick up the ragged shreds of turf and stack them in her wheelbarrow. "It's no good trying to patch it up with these!" she said severely. "I'll have to put them on the compost heap." "Glass! From the greenhouses. Hurry up! What are you waiting for?" Annie shook her head. "Crazy," she muttered. All the same, she fetched a barrow-load of broken glass and tipped it in a crashing heap by the Earthwyrm's tail. "Now go and get some more," it ordered. "Lots more. And bring those overgrown seedlings from the nursery beds." Annie opened her mouth to protest, but the wyrm had turned its back on her to nose through the shattered glass. She sighed, and set off again with the wheel-barrow. In between barrow-loads she watched the Earthwyrm, trying to puzzle out what it was doing. It had laid glass in jagged paths all around the hill, right the way up to the sundial at the top. The whole thing looked rather untidy and decidedly dangerous. "Crazy paving," commented Annie under her breath. She didn't think much of it. The earthwyrm slithered down to where she stood. "Stand well away!" it warned. Then it sucked in hard, and breathed out a stream of fire. The flames that licked around the hill started off red, as before. But this time, as the Earthwyrm puffed out more and more, they gradually changed colour to orange, then to yellow, and finally to dazzling white-hot. Annie had to back away, shielding her eyes. The hill steamed and hissed. Round and round stalked the Earthwyrm, pausing only now and then to take huge, gasping breaths and breathe out yet more fire. At last it stopped and lay down, panting. The hill was covered in a cloud of steam. When the fog parted, Annie gasped. The spiky trails of broken glass were gone. In their place lay a shimmering maze whose myriad paths intertwined in elegant crystal knots. The glass had melted. It was jagged no longer, but smooth, and full of bubbles. As the sun broke through a cloud, the twisting paths shone like rivers of liquid gold. "Just the planting up to do," whispered the Earthwyrm hoarsely. It shook its tired head. "You do the top, I'll do the bottom. Watch out for the glass. It's hot." Together they planted the seedlings between the loops of glass. Annie worked down from sundial, the dragon worked up, and they met in the middle just as the sun was setting. "If the King doesn't like that, there'll be no pleasing him," said the Earthwyrm gruffly. "He'll like it," Annie said. "I do." She made a low and sweeping bow. "Thank you, Earthwyrm. Would you like to come home for some supper?" The Earthwyrm inclined its long neck gracefully. "How kind." "What do you eat?" asked Annie with some trepidation. But the wyrm said promptly, "Eggs. Keep the pesky birds down, I say. Think they can fly! Hah!" So the Earthwyrm came to Annie's house for supper, and stayed for three days. It sat in the garden with Annie's father, drinking ginger beer and smoking. Annie's father smoked a pipe; but the Earthwyrm just smoked. Every now and then it crunched up a raw egg, shell and all. It got on very well with Annie's father. They talked about pruning and propagating and layering and grafting until Annie grew quite bored. "I'd be glad if you took over as Royal Gardener," said her father at last. "You don't need to wait for twenty years. I'd like to retire early. The job doesn't suit my back." He turned to Annie. "Would you mind very much, Annie?" Annie looked up from the grass where she was watching beetles. "Actually, I never wanted to be Royal Gardener anyway," she admitted. "I'd much rather be Royal Beekeeper instead." "That's all right then," said her father; and they sat peacefully listening to the sounds of the Garden Party drifting over from the palace. It sounded like a great success. "Just one thing puzzles me," said Annie's father, pulling on his pipe. "You dragons are supposed to love treasure, aren't you? Don't you all have hoards of gold? Or are Earthwyrms different?" "Not so different," said the dragon. "Gold is my favourite, too." It gazed around the little garden at the petals glowing in the evening sun: marigolds, nasturtiums, goldenrod, and sunflowers. "Treasure," said the Earthwyrm softly. Want to try another free story?